Christmas is coming! As the end of the year approaches, newspapers and websites turn reflective, looking back on the past year and rounding up their favourite songs, films and books of the year. With that in mind the publicity team have decided to pick out the books that we loved this year. This is a road trip book to remember- even if the aim of central character Trevor is to forget his recent relationship woes! Heading down a path of self-destruction, he rents a car, packs a boot-full of alcohol and leaves Canada to drive across America and rediscover himself. This is not your average tale of self-discovery however; seeing Trevor come across gun-wielding bikers, a drug addict thief and a persistent but incredibly mangy cat along his travels. Not only is this as fast paced as Trevor’s own journey, but it’s laugh-out-loud funny, and made me chuckle on many a morning commute! What girl wouldn’t like a cookbook that encourages tasty sweet treats, but promises to lighten the calorie load? With the huge success of the Great British Bake Off in the UK this Summer, many of us have been getting out the mixing bowl and baking up a storm. Kim Barnouin is a celebrated vegan chef and her collection of cakes, pies, cookies and breads not only look fantastic but taste just as good! I can’t say I’m blessed with the best culinary skills, but the recipes are laid out so simply, and feature ingredients widely accessible that thankfully even I could manage to rustle up a delicious dessert…before gobbling it all up (no elasticated waistband needed hoorah)! It wouldn’t be Christmas without the Cozy’s here at Turnaround! This year sees Emma, Jane Eyre and Oliver Twist join the cast of hand-stitched cuddly characters, and they do not disappoint! What I love about this series is how you can actually recall lines from the original novels when you look at the scenes – I can clearly hear Mr Knightley scolding Emma ‘It was badly done indeed!’ in the static scene accompanied simply by the word ‘angry’. Not only are they sweet children’s books, they’re incredibly nostalgic, and reading them makes me feel like a kid at Christmas (lucky it’s so close then!). These are books made to be displayed; gorgeous covers and brightly coloured paper, so beautiful did they look stacked on my desk that I was almost loathe to send them out for review. Beginning with A for Austen’s Pride and Prejudice the series contains classics and contemporary novels, each cover resplendent with an individually designed letter corresponding to the author’s surname, designed by font superstar Jessica Hische. Elizabeth Haynes’ debut novel Into the Darkest Corner had me up all night feverishly turning the pages in a clammy sweat desperate to know what happened and the same growing sense of chilly unease haunts her third crime novel. With a glimpse into an extremely creepy protagonist’s mind and a desperate race to rescue a potential victim the whole novel left a lingering aftertaste of fear with me. An exciting novel which beat some pretty big hitters such as Pynchon and Lahiri to win the National Book Award in the States. Told in the distinctive voice of Henry, a young slave boy, the novel follows his adventures after he is kidnapped by the legendary white abolitionist, John Brown. As my knowledge of the American civil war was mostly gleaned from GCSE history, this was a fascinating insight into real events and kept me amused with its irreverent prose. Wow this book really is AH-MAZING. Packed full of incredible photos that had us all swooning, there’s previously unpublished snaps of Frank Sinatra, Marilyn Monroe, Martin Luther King, JFK and Sammy Davis Jr. This is a gorgeous deluxe, limited edition package and would take pride of place on any coffee table. Having been privileged to read an early proof of J. Paul Henderson’s Last Bus to Coffeeville I can’t wait to see final copies when this is published next April. A hilarious and poignant road trip as one man travels across the US to fulfil the last wish of an old friend. This was at the top of my holiday reading list and amply repaid the extra weight in my suitcase as I raced through it, risking sunburn and confused stares on the beach as I chuckled away. There are so many painfully cool things shoved into this book, I can hardly stand it! Ricardo Cortes – best known for illustrating the #1 New York Times bestseller Go the F*** to Sleep – tells the story (in words and pictures) of how one of the biggest companies in the world continues to bypass an international ban on coca. Coca-Cola is the most popular soft drink on earth. Caffeine is the most widely used psychoactive substance. Cocaine… well, some people just seem to like doing reading about cocaine. This book discloses the associations between all three. Cortes’ controversial illustrated work first caught people’s attention when he wrote It’s Just a Plant: A Children’s Story of Marijuana. Now he’s back on top form, shattering misconceptions about drug prohibition and the power of large corporations, and managing to entertain with some seriously excellent artwork along the way. Perfect for your anti-corporate, anti-prohibition friends. 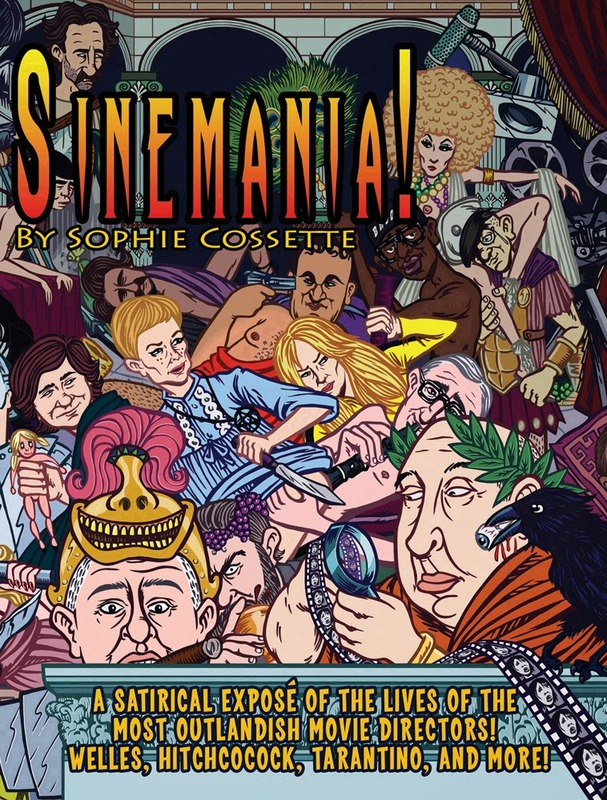 Perhaps even more irreverent than my first choice, Sinemania! is a loving but wickedly humorous tribute to cinema’s weirdest film directors. This adults-only (seriously…) graphic novel is made up of merciless parodies of the likes of Orson Welles, Alfred Hitchcock, Quentin Tarantino, Woody Allen, Tim Burton, Spike Lee, Kenneth Anger, Stanley Kubrick, Roman Polanski, Ken Russell, Guy Ritchie, Fritz Lang, Werner Herzog, Pasolini, the Cohens and the list goes on and on and on! If you’re like me, you’re bored of seeing movie stars in the headlines; maybe you get this feeling that the people behind the scenes are even more ridiculous than the people on screen. Sinemania! allows you to indulge in that thought, all while giggling like a schoolboy over Sophie Cossette’s 18-rated comic panels. Not one for your gran, of course. The reception that Eimear Mcbride has received for her novel A Girl is a Half-Formed Thing is almost unheard of for a debut, or any release for that matter – and she deserves it. Telling the powerful and profoundly affecting story of woman’s relationship with her brother after a tumour leaves him severely brain damaged, the author plunges the reader into the narrator’s head with astonishing skill. The winner of the Goldsmiths Prize for Fiction, the fact that McBride has been widely compared to Beckett should tell you everything you need to know about this masterpiece – read it now, and be among the first to experience a novel that may well go down in history as a true classic. Forget the controversy currently surrounding Abdellatif Kechiche’s Palme d’Or Award-winning movie Blue is the Warmest Color, and instead read Julie Maroh’s magnificent original graphic novel about two passionate young women as they discover each other, and themselves. Both tender and bittersweet, Maroh’s beautifully illustrated story is a touching exploration of the elusive, reckless magic of love. Anyone who still holds any doubts about graphic novels’ ability to match traditional literature in telling a story with depth and creating real characters should give this a go – you’ll be surprised. The British secret services have been depicted in print many times, most notably by such writers as John le Carré. Yet when Mick Herron came to depict these shadowy forces in action, he rejected the traditional notion that, just because his characters somehow landed a job in MI5, they have to be competent or successful at what they do. In Dead Lions, London’s Slough House is where the washed-up spies go to while away what’s left of their failed careers. It’s a darkly comic and original premise for a spy thriller, as acknowledged by the Crime Writer’s Association when they awarded it the Golden Dagger Award for Crime Fiction. I know I’m not the only one looking forward to Alan Moore and Kevin O’Neill’s next illustrated masterpiece! Rather cruelly, we put a poster of the cover up on our stand as MCM Comic Con in October, leading to fans rushing over to see if we’d miraculously got the book nearly six months before it’s official publication date – no such luck I’m afraid, but this will be worth the wait! Set in the League of Extraordinary Gentlemen universe, Roses of Berlin will continue the adventurous tradition of Nemo: Heart of Ice in a blazing narrative that rampages through twentieth century culture. At this point, there is not much more that can be said about how great this series is. But any comic fan who has not tried it needs to get out from whatever rock they are under. Matt Fraction brings Avengers mainstay Hawkeye away from the usual cosmic threats he faces, pairing him off with Young Avenger Kate Bishop as they clash with the New York Underworld, whilst helping their new neighbours and partaking in many rooftop barbeques. Hawkeye has had several titles before, but none have hit the target (pun intended) quite as perfectly as this. Fraction’s intelligent storytelling and witty dialogue are a joy to read. Along with some of the most creative sequential art and covers you’ll ever see courtesy of David Aja, Javier Pulido and Francesco Francavilla, this title has gone from strength to strength and shows no signs of stopping. The Young Avengers are some of the best characters Marvel have created in the past ten years. Being a huge fan, I was thrilled to find they would be returning and, to cap it off, it would be by two of my favourite creators: Kieron Gillen and Jamie Mckelvie. Team stalwarts Wiccan and Hulking are pursued by Interdimensional Parasites who have been impersonating Hulkling’s parents. They soon find themselves alongside allies new and old including co-star of Hawkeye and former teammate Kate Bishop, her intergalactic boyfriend and David Bowie wannabe Noh-Varr, fiery Latina dimension hopper Miss America and the God of Mischief Loki (Tom Hiddleston fans may rejoice). Fans of Allan Heinberg’s original series should have no qualms as Gillen seamlessly captures the tone of the original series whilst bringing something fresh to the table. He has always had a gift at writing young diverse characters and this is no exception. Add to that the impeccable sense of design and fashion present in Mckelvie’s artwork and you have one of the most unique superhero comics on the shelves. One could argue the zombie genre is massively oversubscribed. It was therefore a great surprise that Sankarea was one of my favourite manga reads this year. The normal reaction to a zombie is to run in fear, so I was slightly confused that the protagonist of this story wanted one for a girlfriend. Yet Chihiro Furuya gets his wish when popular yet depressed Rea Sanka drinks one of his experimental potions in a suicide attempt. What follows is a morbid yet surprisingly heartwarming comedy as Rea comes to terms with the pros (no pain or hunger) and cons (rigor mortis, limbs falling off and the constant worry of becoming a mindless brain eater) of a zombie and Chihiro learns that having a zombie girlfriend isn’t as great as he thought. I have to admit it was a nice change not seeing a bunch of strangers hidden away in a cramped area fending off wave after wave of zombies. So Kudos to Mitsuru Hattori daring to fresh in the current zombie era. It was certainly unlike any roadtrip we'd ever had – but so much the better for it! Happy Christmas to you too! This entry was posted on December 4, 2013 by turnaroundps in Graphic Novels.